Descriptive analytics is usually the first step in data analytics exercise. As the name suggests, it describes a dataset. Descriptive analytics is usually the first step in data analytics exercise. As the name suggests, it describes a dataset. It answers the question, “what happened”. shape or pattern factors like standard distribution. What do these numbers tell? In total, they both sold 254 items, which means they both are equally competitive. Their average is 42.3, which again says they both are equal in caliber. The standard deviation paints a different picture. The standard deviation measures concentration of data around the mean. The standard deviation for the first manager is 1.8, while the second one is 16.2. What does this mean? The first manager is consistent week after week in meeting his target, but the second manager is not. If all else remain the same, then this data indicates that the first sales manager is more dependable than the second one. We will use two packages for this purpose. The first one, csvtojson, is to read csv records and convert them into json values. The second one, simple-statistics, is to compute statistics. Refer the documentation for all the features of this package. In this post, we are using only the essential functions. Simple Statistics takes an array of values and computes statistics. 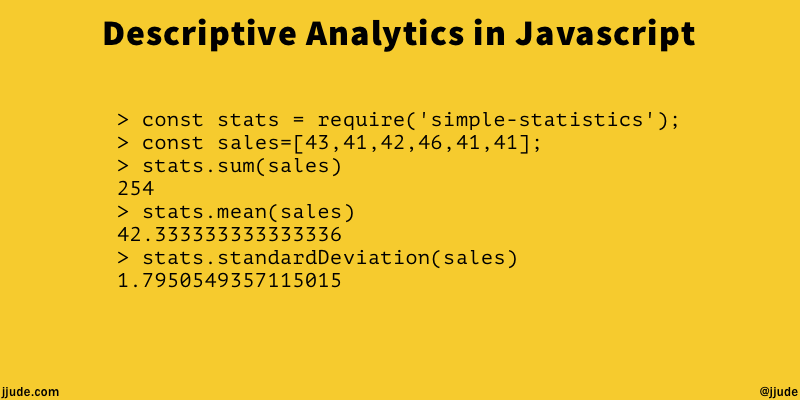 Computing sum, mean, and standard deviation for the above two sales values goes like this. Too often when we learn a subject, we get neatly arranged examples. It is like going to the zoo. But the real-world is complex. Recently, I analyzed sales figures for a large e-commerce company. There were about 150000 records. I couldn’t glance through the numbers to make sense. I loaded all the data and analyzed through simple statistics package. It showed me how different real-world sales figures compared to the neatly arranged values we get while learning. The sales engine is completely messy for them. Each of the descriptive statistics element says only one thing: there is no consistency in their sales. A good book to understand descriptive statistics and in general numbers, is from “The Economist”, aptly titled Numbers Guide. If you want to understand standard deviation, read Understanding Standard Deviation.